It’s the Clam Shell! 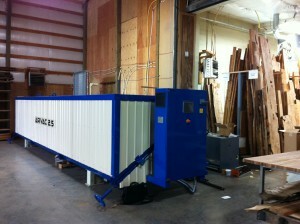 This machine is sized for everyone from the small wood shop to the large concentration yard. This kiln is forklift loaded from the side with sticker piles of lumber and has an optional rubber membrane to press the load flat with 1200lbs/in2 but can be installed in the back corner of your shop.